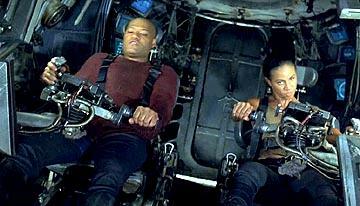 All things must come to an end, and six short months after The Matrix Reloaded, The Matrix Revolutions T.S. Eliot's its way to a conclusion. For anybody who felt that Reloaded was chock full or neo-religious blather, rest assured that Revolutions is the film for them. It is two hours of lifeless acting and nonstop action. Sure its looks great, but there is so much thought put into how the film looks and so little invested into its characters that The Matrix Revolutions is nothing more than eye candy. Remember Final Fantasy? Not many people do. This is an underwhelming ending to a trilogy that showed some promise and changed the way Hollywood did their special effects. At the end of Reloaded, Neo (Keanu Reeves, The Matrix Reloaded, Hardball) discovered that he could use his powers outside the Matrix, the Machines were tunneling towards Zion, there was a traitor on Neo's ship, and Agent Smith (Hugo Weaving, The Matrix Reloaded, The Two Towers) was finding that he also had some newfound powers. The two main parts of Revolutions are the assault on Zion and the final showdown between Neo and Smith. And they are far too long. When the Machines finally reach Zion, it is a battle of epic proportions, as humans and their mech-like machines fight against a never-ending army of Sentinels. This sequence shows just how detailed and realistic writer/directors Andy and Larry Wachowski (The Matrix Reloaded, The Matrix) conceived their world. It also illustrates how empty the film is. After fifteen minutes, one is ready to say "enough already, we get the point," but it keeps going. And going. And going. It is a non-stop assault on the senses that initially awes the viewer in its scope, then becomes boring in its repetitiveness. At the same time, Neo is trapped in a train station at some point between the real world and the Matrix. Trinity (Carrie-Anne Moss, The Matrix Reloaded, Chocolat) and Morpheus (Laurence Fishburne, Mystic River, The Matrix Reloaded) journey back into the Matrix to try to make a deal with Merovingian (Lambert Wilson, The Matrix Reloaded, Les Tombales) for Neo and to consult the Oracle (Mary Alice, Sunshine State, Catfish in Black Bean Sauce). Eventually, Neo and Trinity eventually discover that they need to make their way to the Machine City, and Neo eventually fights Smith in another long and underwhelming sequence in the rain. After discovering he can replicate himself into hundreds of other Smiths, he decides the best way is to fight one-on-one, while all the other Smiths watch. Uh, doesn't he want to win? 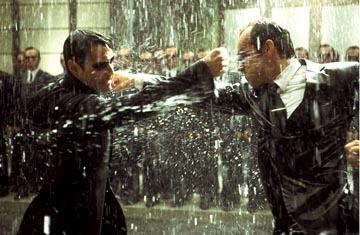 Some of the favorite elements of the other two Matrix films were the martial arts and bullet time. Here, like in Reloaded, the Wachowski's overkill the concept. There are only so many times that watching someone beat somebody else in slow motion is exciting. Then, it becomes the same thing. In fact, with some judicious editing and moving things back into normal time, one could probably combine Reloaded and Revolutions into one normal length film. Contributing to the lifelessness of everything is the dour attitude all of the actors have. It's as if the Wachowskis told everybody to show as little emotion as possible. Yes it looks kind of cool to see how indifferent they are, and yes, the humans have little to be happy about, but their energy level is so low, especially Niobe (Jada Pinkett Smith, The Matrix Reloaded, Ali), that they themselves look bored. Weaving is on the opposite end; he looks and feels like the only person having fun. In giving him a personality, the Wachowski make him far more interesting and ensure that the villain unintentionally trumps the hero. The largest problem is that Revolutions is not a good ending. It leaves the door open for sequels (which are pretty unlikely, at least in film form) and fails to answer many of the questions raised in the past two films. All of the philosophical doublespeak that dragged down Reloaded amounts to nothing. There is a tremendous amount of anticipation that all leads to nothing. The originality of The Matrix (which, storywise, wasn't actually that original) is gone, replaced by visuals. And the visuals are the only thing one can really appreciate about Revolutions. Reeves does look cool doing spin kicks while his trench coat flies behind him, and Fishburne's glasses still somehow rest on his nose. The sets, real and CGI are expansive, immersive environments, highly complex and realized with the utmost attention to detail. If only as much attention was paid to the story. 2 hours, 9 minutes, Rated R for sci-fi violence and brief sexual content.